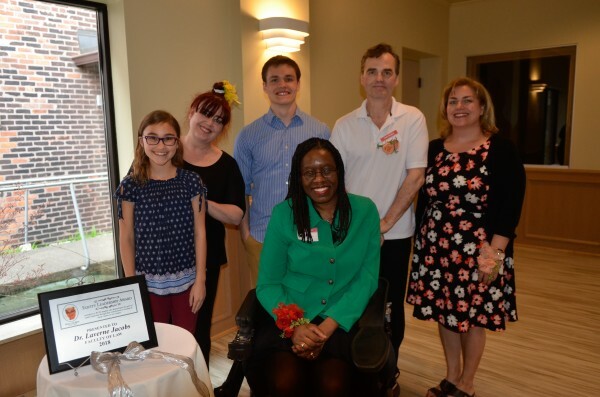 Family, friends and colleagues gathered on May 2 to honour Laverne Jacobs as the 2018 recipient of the Mary Lou Dietz Equity Leadership Award. An award reception was held in Assumption Hall’s Freed-Orman Commons. Dr. Jacobs was nominated by Faculty of Law dean Christopher Waters who spoke to her impressive record of scholarly work on the rights of disabled persons, mentorship and innovative strategies, and activities for creating a climate of equity and diversity on campus and in the community. The Award was established by WUFA’s Status of Women, Diversity and Equity Action Committee in memory of Dr. Mary Lou Dietz, to honour members who demonstrate the spirit of leadership through their contributions in creating an equitable culture on campus.